JB - Y'a pas photo, Y'a pas match single? 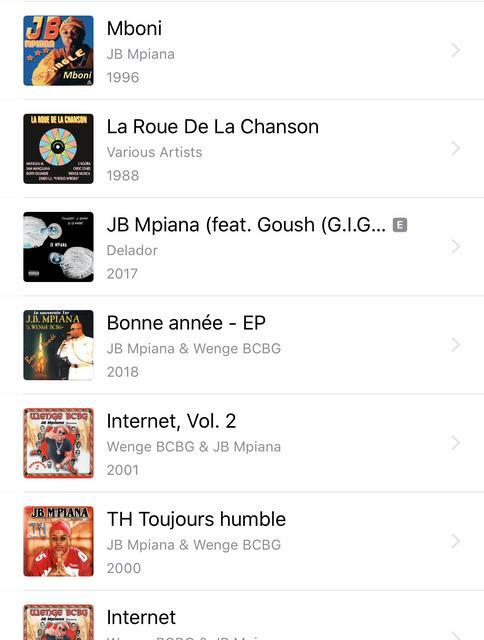 How about track down every Congolese album and put on streaming. No lie I shed a tear when I saw this. Been had uploaded the albums myself fir my listening, but this is what real progress is. Lazy a** Roger Ngandu and co all these years not caring about mp3s, online catelogs, streaming, etc. Now that's what I'm talking about! I'm starting to think it wasn't Jb's fault but Simon Music's cause all the albums that have been put on have been under his label like pentagone, all of Jb and BCBG's albums under that label, Miracles and Feux De L'amour got taken down and reuploaded in a few days and The album Miracles is in better quality. Kindly re-share this link ndeko. It says file expired. Anyone have Bidjanas album and Kissindjora? Neither are on digital.